Event hosts were Leslie Sibert (BEE ’85), vice president for Grid Edge Technology and Development at Southern Company, and Gina DeSimone (MSEE ’82), vice president of Division Operations (retired) from The Boeing Company. Students and faculty receiving awards and recognitions at the Georgia Tech Faculty/Staff Honors Luncheon, Women in Engineering Awards Banquet, Faculty & Staff Service Recognition Luncheon, Sigma Xi Awards Banquet, and Georgia Tech Student Honors Celebration were also recognized. 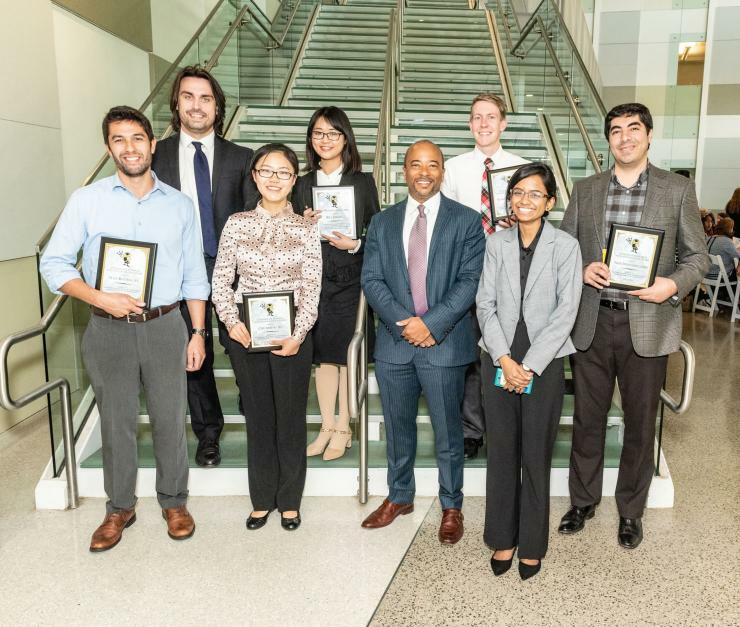 ECE Outstanding GTA Award winners were also recognized for awards they would receive at the Eta Kappa Nu Spring Picnic on April 13; they were Aravind Balasubramanian, Gad Ilunga, Sizhuang Liang, Akshay Nagendra, and Bige Deniz Unluturk. ECE Academic Advisor Tristin Carmichael was recognized for his upcoming graduation with an Ed.D. in Leadership (concentrating in Higher Education Leadership) from Valdosta State University. Below are the recipients of the 2018 Roger P. Webb Awards. Congratulations to everyone on another fantastic year! 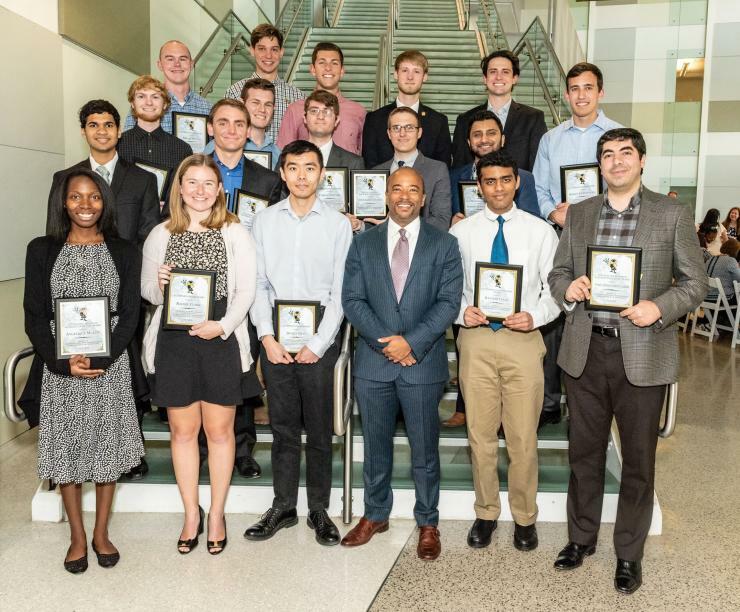 Eta Kappa Nu, the honor society for ECE, recognizes the electrical or computer engineering student who is in their second year and who has the highest scholastic average. This award is presented to the student who is in their third year and who has the highest GPA in ECE. This award recognizes an undergraduate student who has demonstrated an unusually strong aptitude for research. This award is presented to the ECE senior co-op student who is considered of the highest caliber by his/her co-op employer. Investing time in community activities can have significant rewards for Georgia Tech in the future, and recognizing students who participate in and organize such activities helps to motivate other students to do the same. This award is given to the electrical or computer engineering student who, in the opinion of the ECE faculty, has done the most to improve the educational environment within ECE or Georgia Tech and has contributed significantly to both student welfare and student-faculty interactions. Eta Kappa Nu, the honor society for ECE, recognizes the senior electrical engineering student who has a very high scholastic average and who plays an active role in extracurricular activities. Eta Kappa Nu, the honor society for ECE, recognizes the senior computer engineering student who has a very high scholastic average and who plays an active role in extracurricular activities. These awards are given to the electrical or computer engineering senior(s) with the highest academic average. These awards are made to the outstanding graduate students in ECE, as determined by scores made on the doctoral preliminary examinations during 2017-18. Teaching undergraduates is one of ECE’s most important missions. Teaching assistants are necessary to ensure that every student has the opportunity for personal attention during their course of study. Research is the cornerstone to ECE’s success. Nurturing bright and hardworking graduate research assistants (GRAs) are among the most important factors in ensuring that ECE remains a leader in the research community. These awards will be given to the GRAs who have demonstrated particular excellence in performing their duties. These awards recognize the classified staff members who have demonstrated exceptional job performance and/or service to ECE above and beyond the call of duty. This award is presented to a researcher who has made a significant contribution to the research efforts in ECE. This award is presented to the researcher, classified employee, or general faculty member who has made a significant contribution to the ECE teaching or academic program. This award recognizes the most outstanding assistant professors and/or associate professors in ECE with less than 10 years since their initial faculty appointment. 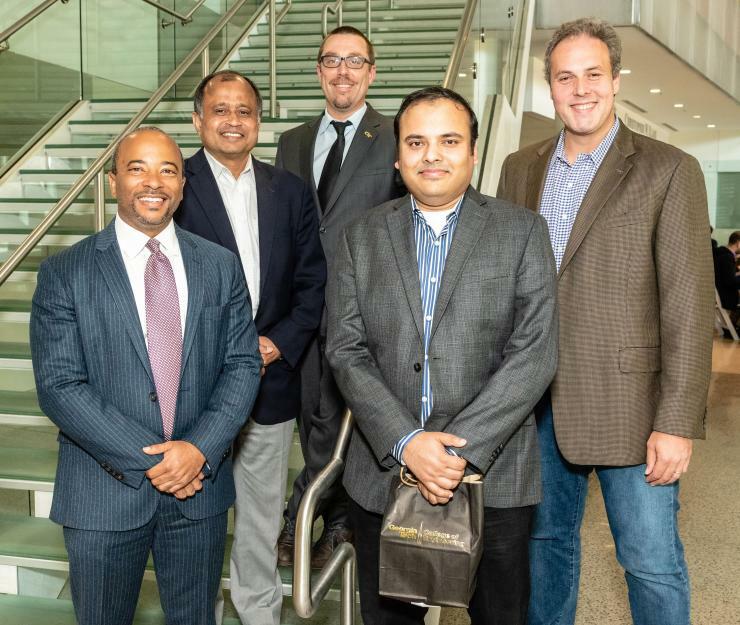 This award is presented to a faculty member whose mentoring of junior faculty–in connection with teaching or research activities over an extended period of time–is judged to be outstanding. This award is presented to the senior faculty member who has made significant contributions throughout his/her career.